For this page we have chosen to show albums translated in the Ijekavian dialect (Latin script) and published in the former-Yougoslavia (SFRY) only. Albums that have been publised in Croatia or Serbia after the disolution of the SFRY can be found on the Croatian and Serbian pages respectively. Asterix was also published in the Ekavian dialect (Cyrillic script) but in the former SFRY not in a complete album. The first Asterix story, Звездоје и Клеопатра (Zvezdoje i Kleopatra), appeared already between 9 October 1966 and 6 August 1967 in the Sunday Express Revue (magazine published by Politika). Politika also published Asterix in both Cyrillic and Latin script in their magazine Politikin Zabavnik between 1985 and 1995. Stories were divided into 2 or 3 magazines. Other magazines with Asterix are Panorama and Stripoteka magazine. NIP Forum is the publisher of softcover (Stripoteka - Asteriksov Zabavnik) and some hardcover editions. NIP abreviates Novinsko Izdavacko Preduzece, which means Press Publishing Company. Series Stripoteka - Asteriksov Zabavnik, containing 48 softcover albums. Other albums in this series feature Lucky Luke. Published between 1975 and 1988. Decje Novine, publisher of magazines, softcover and some hardcover editions under the name Biser Strip or Super EKS Almanah. This serie of Biser strip contains 96 softcover albums in colour or black & white, including 10 Asterix titles. Publisher is Decje Novine (printed by "Privredni pregled" Beograd). Other books in this series are Lucky Luke, Bluberi, Strumpfovi (Smurfs), Gaza etcetera. Some translations are very different from the softcover editions above (at least Broj 79 vs. SAZ 14). 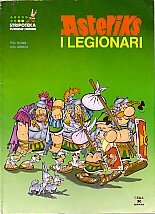 This serie of Biser strip contains 16 softcover albums, 6 Asterix titles. Published by Decje Novine (printed by NISP "Dnevnik" Novi Sad). Other books in this series are: Lucky Luke, Iznogud, Klifton and Spiru. Magazine Super EKS Almanah, editor Decje Novine. This Asterix story in a single issue. This magazine also contains an episode of Mandrake the magician. There are 5 hardcover editions.